Our brother and comrade Fidel Castro was one of the outstanding revolutionary leaders over the entire course of recorded world history. There are so many components of Fidel’s amazing life and accomplishments: his defense of Cuba’s national emancipation and sovereignty, his socialist internationalism, his defense of the struggles and the interests of, as he often put it, “the oppressed and exploited overwhelming majority” of humanity. We can speak of Fidel as the architect of Cuba’s conquests in the fields of health care and education on the island and of Cuba’s amazing medical and disaster-relief internationalism which has aided many millions; we can speak of his extraordinary skills as a military commander. We can speak of the great advances in the struggle for Black emancipation and women’s liberation that the Cuban Revolution ushered in, and much more. 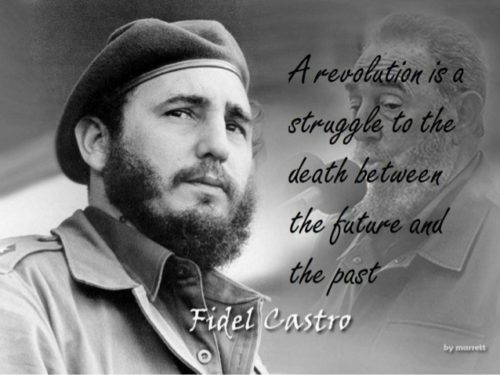 But I want to highlight and emphasize what I think is the central synthesizing aspect of Fidel’s example and legacy, that is, Fidel’s embrace of revolutionary Marxism, as he understood it, and to the outstanding contributions which Fidel made to Marxist theory and practice. I say this because, to me, this is the only way to really understand and assimilate the scale and scope of his achievements and indelible example. Fidel burst into the post-World-War-II political scene in Cuba and beyond with the July 26, 1953 Moncada Barracks attack. Fidel was and will always be seen as a “revolutionist of action.” But Fidel’s actions were always motivated by great ideas and theories, socialist ideas that developed, almost organically, toward Marxism. And he translated those ideas into a political program, organization, action, and tactics that within less than 6 years of the attack on the Moncada Barracks led to the triumph of the Revolution, the 60th Anniversary of which we celebrate this New Year’s Day. And Fidel was deeply read. He was a voracious reader on all things, but, at an early age, he studied, immersed himself in, and absorbed political economy, history, and philosophy. And, as he became involved in political struggles in his revolutionary youth, this put him on a trajectory leading to Marx, Engels, Lenin and scientific socialism. This developed and was enhanced from his strong grounding in the thought of José Marti and the traditions of anti-imperialism in Latin America and, I would add, the struggle to abolish slavery in the United States, the history of which Fidel was fluent in. In the two years Fidel was imprisoned after the Moncada Attacks, he immersed himself in the history of the French Revolution. I remember, when I was about 19-years-old, and heavily involved in the mass nationwide student strikes against the Vietnam War in May 1970 at Indiana University, reading the classic biography of Karl Marx by the German revolutionary socialist Franz Mehring after reading a speech by Fidel where he talked about the book’s great influence on him. And it is a great book. I would give two examples of how Fidel’s Marxism guided his actions in decisive historical moments: One, Chile, was a historic defeat for the working-class and the oppressed; the other, the defense and conquest of Angolan independence, the winning of independence for Namibia, and the unraveling and defeat of the apartheid South African state, was an historic victory that changed the course of African and world history. Fidel was in Chile from November 10 to December 4, 1971, less than two years before the US-backed military coup overthrowing the Popular Unity government of Salvador Allende. His time there has been documented in books that are still in print or accessible online. In a cumulative master class in the Marxist method, Fidel gave speeches, interviews, press conferences, and had mass interactions with Chilean workers and trade unionists, peasants, and students. In speech after speech, Castro foresaw the gathering, impossible-to-be-avoided, political, social, and class showdown that was coming. He did everything in his power to prevent a historic defeat and slaughter of working people in Chile like what Ernesto Che Guevara had witnessed in 1954 Guatemala. In southern Africa, at each political and military turning point of the 1976 – 1999 war between Cuba and its allies, on the one hand, and apartheid South Africa and its allies, covertly backed by Washington, on the other, Fidel’s clear revolutionary Marxist perspective was that a military victory of apartheid South Africa in Angola would inevitably be a decisive victory that would prolong the life of the white-supremacist regime for an entire, and not inconsiderable, period. What Cuba did was done for nothing material in return, out of human solidarity and revolutionary duty. Fidel fully grasped, as a historical materialist, that the political impact of an apartheid-US victory in southern Africa would parallel in its historical impact: the end of Reconstruction in the post-Civil War United States; Hitler’s destruction of the German workers’ movement; Franco’s defeat of the Spanish Republic; and Pinochet’s coup in Chile. It takes a long time for the working class and oppressed peoples and nations to recover and revive after a historic defeat or major setback. This is a law of the class struggle and politics. Fidel’s example is bound to be a permanent, weighty, and material political force for future generations and time immemorial. Fidel’s example is certain to be continually renewed and embraced again and again by new generations of fighters for social-justice, socialists, and revolutionaries, including inside the United States. This article was posted on Thursday, November 22nd, 2018 at 5:02pm and is filed under Africa, Angola, Chile, Communism/Marxism/Maoism, Cuba, Education, Fidel Castro, Health/Medical, Internationalism, Namibia, Revolution, Revolutionaries, United Nations, United States.